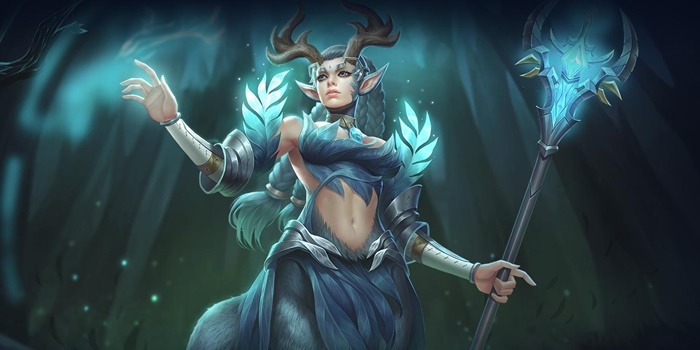 A guide to Arena of Valor's hero Peura, the Faerie Guardian. Peura uses aura abilities to buff and heal her allies while disabling opposing heroes. Peura is a Support hero who excels at buffing and healing her allies during team fights. Offensively, she is skilled in disrupting enemies with her area of effect and bouncing abilities. Despite low solo potential, Peura’s presence in a fight can exponentially increase her team’s power. Healing -Peura is one of the only heroes in the game with a reliable healing ability. She can keep allies up in team fights and prolong sieges with Healing Light, allowing for an oppressive presence in engagements. Great in Team Fights – Peura is especially useful during team fights. She can heal and buff her entire team with Healing Light and Nature’s Rally while inflicting stuns and slows with Forest Sentry. Nature’s Rally additionally damages and stuns any enemies who are in its area of effect. All of this coupled with her allies’ abilities can make quick work of enemies and net Peura a lot of assists during clashes. Decent Range – Peura’s abilities all have moderate range to go along with her ranged auto attacks. This enables her to harass enemies and provide support to her team from a safe position. Relies on Allies – On her own, Peura has difficulty dealing with enemy heroes since her abilities are supportive in nature. She needs allies who can take advantage of her stuns in order to be effective. Susceptible to Crowd Control – Peura’s Healing Light and Nature’s Rally abilities need her to stay close to her intended targets. As such, she is particularly vulnerable to stuns and slows, especially when she channels Nature’s Rally. Peura needs to lane with an ally to be effective. She is practically useless on her own so should avoid solo laning at all costs. Use Healing Light whenever your allies get hit by opponents to keep them in lane and farming. Cast Forest Sentry on the enemies, especially when they are bunched together or near their minion wave. This will make your ability bounce between them, stuninng each time it hits. Start by taking a single rank Forest Sentry to help your lane partner during skirmishes. While it does not scale well, it will be more useful should a level 1 skirmish break out. Afterwards, level your Healing Light to max. This will assist your team during clashes. The attack speed buff, cooldown, and amount healed are all improved with each rank, making it a natural choice to focus on first. Finally, take levels in Nature’s Rally whenever you can, as it can devastate enemies caught in its boundaries. Solo Fights: Peura should always be with at least one of her teammates. In the event you find yourself facing an enemy one on one, you should simply try to run away. Forest Sentinel can stun the enemy and give you a bit of additional time to flee to safety. Team Fights: Hit clumped enemies with Forest Sentinel to stun as many as possible. Afterwards, move towards the enemies and cast Nature’s Rally to effect as many fighters as possible. Use Healing Light whenever near damaged allies to top them off and give them some additional attack speed in the process. Riposte – When Peura takes damage, she counterattacks and deals 200 (+1 AP)ˀ magic damage to the attackers and slows their movement speed by 90% for 1 second. This effect only triggers once every 10 seconds. Peura’s defensive passive allows her to get a head start and escape when enemy heroes attempt to kill her. Healing Light – Peura uses healing magic to restore 80/105/130/155/180/205 (+0.1 AP) (+7% of target’s lost HP) HP for herself and nearby friendly heroes. Also increases attack speed by 25%/30%/35%/40%/45%/50% for 3 seconds. Healing Light is a great ability that helps Peura and her team live longer during team fights. During the laning phase, Peura’s lane partner can be more aggressive and harass the opposing laner while she casts Healing Light to regain any HP they lose. Forest Sentry – Peura summons an owl to attack enemies. The owl flies between the enemy units and deals 200/225/250/275/300/325 (+0.35 AP) magic damage each hit (up to 6 hits) and stuns enemies temporarily. When there are 2 or more enemy targets, the same enemy can be hit more than once. Forest Sentry is a strong ability that helps Peura disable multiple enemies. This ability is particularly potent during team fights, as it can interrupt the opposing heroes’ channeling abilities. Forest Sentry is also useful when ganking, especially when the enemies are close to their minions or each other. Once you hit the first enemy hero, it will bounce to the second enemy hero and the other minions, further increasing the duration of the stun. Nature’s Rally – With her Spirit Orbs, Peura creates a zone that increases armor of nearby friendly units by 150/185/220. Enemy units in the zone suffers 150 (+0.27 AP) magic damage every 0.5 seconds and 20% reduced movement speed while in the zone. Enemies who remain in the zone for more than 2 seconds are stunned for 1.25 seconds. Peura’s ultimate has a large area of effect. Take note of the exact size so that you can affect as many allies and enemies as possible during team fights. After the ability is triggered, the circle will move with Peura. Prioritize on taking out Peura during team fights to prevent her from spamming Healing Light to patch up her weakened allies. Avoid sticking close to each other during team clashes when facing an opposing Peura since her Forest Sentry can easily ensnare the team, preventing them from executing their abilities. Visualize the AoE radius of her ultimate and use it to your advantage to avoid being enveloped in its stunning effect. If she manages to capture you inside the circle, be sure to perform a dash ability or spend a Flicker to avoid suffering from the stun. You can also run a set more typical to mages to up her ability power and thereby ensure some additional healing with Healing Light. Violate, Devour, and Hex are some of the best in this regard. Peura is decent against tanks so long as she keeps her distance. Her Forest Sentry is a good tool when harassing or disrupting their initiates. However, if they manage to disable her first, she is susceptible to taking whatever damage they have. Similar to with tanks, Peura is also good against warriors. Her Riposte allows her to slow enemy warriors who hit her with abilities or auto attacks, leaving them open to follow up damage or a disable from Forest Sentry. Peura’s passive helps her do okay against assassins. However, as a baby-sitting support hero, she is not supposed to be out alone often and thereby shouldn’t be the target of enemy assassins. She is squishy without her core items and vulnerable to an assassin’s burst damage. During the early game, Peura fares well against mages, Healing Light mitigating any damage she or her teammates take over the laning phase. However, as the game progresses and the enemy mages get their core items, they will become more and more able to easily burst down or disable Peura. Peura generally struggles against marksmen thanks to their sustained damage. She can mitigate this by getting items that bolster her armor or HP. However, doing so will shave off some of her ability to support, since her primary role is providing healing and utility for her team. Peura’s effectiveness against other support heroes varies. As both she and the opposing support will be relying on teammates for damage, the teammate they are paired with will better determine how the fight will go.